Today’s walk was scenic and peaceful, so it was hard to believe something tragic took place here recently. It was and still might be dangerous. On April 4th a 41-year-old American woman, Denise Thiem, went missing when she was walking the Camino between Astorga and Rabanal del Camino. 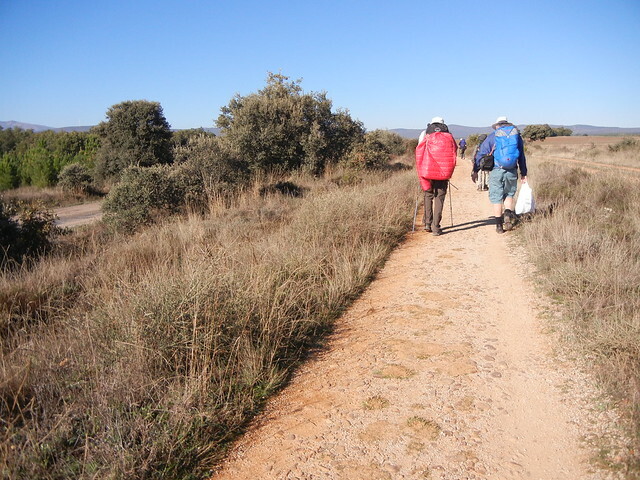 In the months following her disappearance, women were advised to be vigilant, to walk in pairs through this stretch, to stay on the main Camino trail, and to avoid the 4.8 km alternate route which leads through the village of Castrillo de los Polvazares. When we set out this morning, we didn’t know if the whereabouts of Denise or (the worst-case scenario – her body) had been discovered yet. Months ago I had written “DANGER” on the map for this section and knew we had to be cautious. 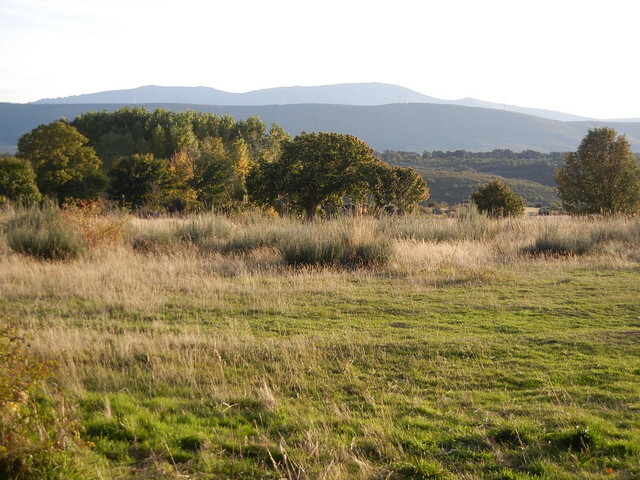 The weather was clear and crisp and the stars were twinkling at 7:45 when we left our lovely suite in Astorga. Street lights were enough to keep us on track when leaving the city. Fields were white with frost, making us especially thankful to be warm and cozy in our new jackets. It was also a good morning to be wearing wool socks on our hands. They made using poles a bit awkward, so sometimes my poles ended up tucked under my arm. 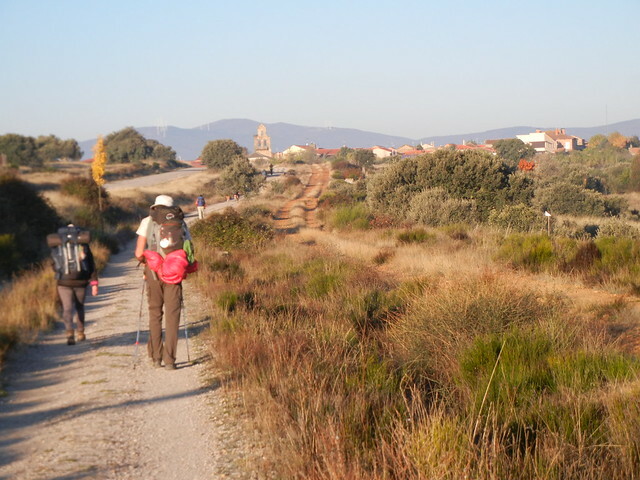 We had walked 7.4 km when we came to an intersection where the Camino route crossed an asphalt road. The road split in two, with one road continuing straight and the other following alongside and very close to the Camino for 14 km., all the way to Rabanal del Camino. It was here that we were warm enough to take off our jackets. While we were busy strapping them onto our backpacks, who should arrive with a great big “Hello!” but Garry from Australia whom we had last seen in Hospital del Orbigo on Day 33. We were glad to see him again and a bit surprised. We thought he might be a day ahead of us and he thought the same about us. We were both behind a day because we were dealing with injuries, Dave with his sore knee and Garry with a pain in his calf which now seems better, thanks to Ibuprofen. We spent the better part of the morning walking while absorbed in conversation with Garry about such things as Roman history in this area, Cervante’s “Don Quixote,” and his upcoming plans for a month-long retreat in Finland. He wants to spend time there writing from notes he has made in his many journals. It was back where the asphalt road and Camino trail began running parallel that I first noticed a man peddling a bicycle slowly along the road. He was dressed in black with a reflective vest over top and some printing that I couldn’t read. A pack and sleeping mat were strapped to the back of his bike, and he looked much like a peregrino. The thing that caught my eye was how slowly he was peddling – so unlike the peregrinos who usually speed along. I couldn’t help but feel a little apprehension because of the woman who, as far as we knew, was still missing. 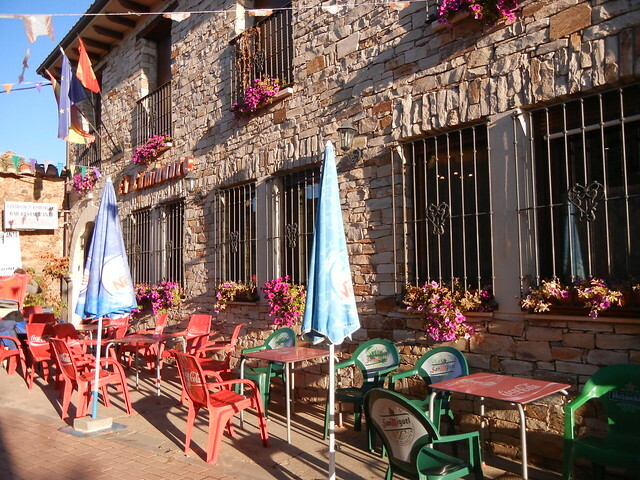 It wasn’t far before we reached a cheerful looking albergue/restaurant (El Caminante) in Santa Catalina. We couldn’t pass that place by without going in for a cafe con leche. What a lovely place to stay! Someone with a green thumb obviously takes good care of it. 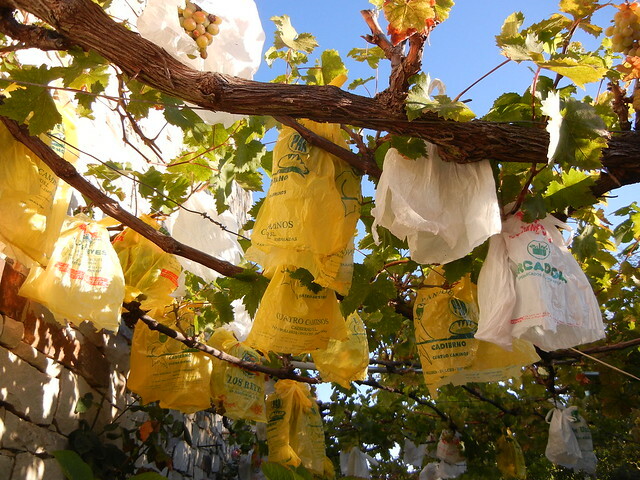 Green grapes hanging from the arbour in the side yard were carefully protected from frosty days (like this one) with plastic bags. Window boxes were overflowing with colourful flowers and the plant pots around the perimeter of the central courtyard and on balconies were brilliant. We must have spent a good half-hour in the cafe before getting back on the trail. There was the cyclist again! How strange! This time, though, I was able to read the writing on his vest, “LIBERTY SEGUROS,” and made a mental note to find out the English translation. 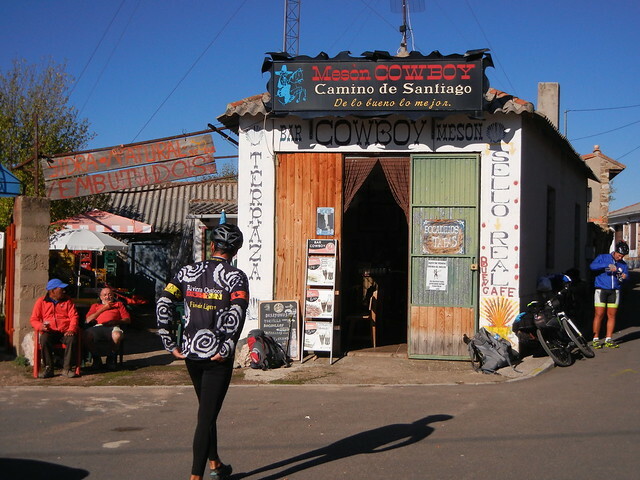 Soon afterwards we arrived at El Ganso, a crumbling village which boasted a monastery and a pilgrim hospital in the 12th century and now boasts a Cowboy Bar! 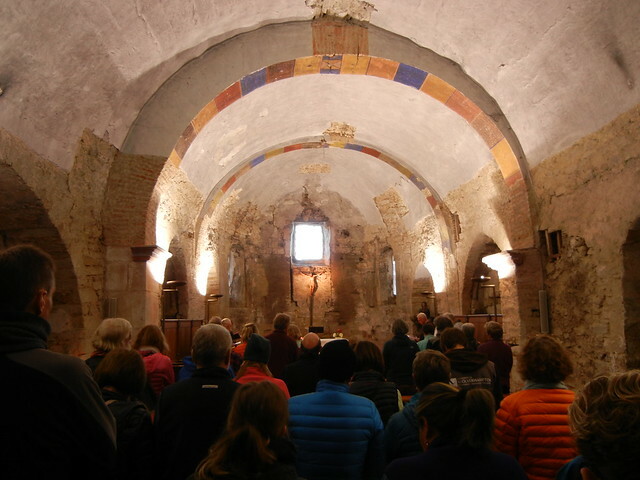 Rabanal del Camino has earned the reputation as one of the most authentic and welcoming villages along the entire Camino. The albergue where we are staying, N.S. del Pilar, can be described as “welcoming” too. We have a clean, bright private room with shared bath in a separate building which also has a living room. The bar is a friendly one and is the only place where we could get Wi-Fi. We had a cerveza, empanada, and connected with the Internet to do some research. “SEGUROS” means “security or safety” in English, so it turns out that this area is being patrolled to ensure our safety. The cyclist I viewed with suspicion was a good guy after all! We also found out that a man who lives near the village of Castrillo de los Polvazares (the alternate route we were advised not to take) was arrested for the murder of Denise Thiem. He led the police to a body, believed to be that of Denise. Bright yellow arrows are used along the length of the Way of Saint James to help mark the pilgrimage route and point the way to Santiago de Compostela. The suspect is believed to have spray-painted fake signs in order to misdirect people off the official route and down a parallel track that led to his remote farm. Several people have reported encountering this man after taking what turned out to be the wrong footpath but, tragically, Denise fell prey to him. We were heading towards a restaurant for dinner when we decided to follow others who were going to hear the Gregorian chanting at the church. It was a unique experience, and even though we didn’t understand the meaning of the words, it was an amazing atmosphere and sound. Coming out of the church we bumped into Leo whom we haven’t seen since Day 6 in Cizur Menor. We thought he would be long gone by now, but he left the Camino for a week to spend time with his wife in Madrid. Now he is back on the Camino and expects to arrive in Santiago about the same time we do. Maybe we’ll see him again along the way! Today’s route was gentle as we headed towards the mountains, but tomorrow will be a different story as we climb to the highest point of the entire Camino de Santiago. We will travel for the next few days through mountain terrain that produced gold, silver, and other valuable ores. Hi Judy and David! Just checking in! We crossed into Galicia today and are in Viduedo (misspelled Biduedo in Brierley’s). We have one rest day left and are planning to be in Santiago the 23rd. Would love to see you there! Hi Grace! How wonderful that you are almost there!!! We probably won’t arrive in Santiago until the 30th – a whole week after you. (We are such slowpokes.) We hope you both have been having a wonderful, worthwhile journey! It’s been a great journey! We would love to catch up with you two at some point! Keep us updated about your arrival in Santiago. We don’t have any definite plans yet and might still be around when you get there!